1. The Mastercourse is online, & you can attend it on a Mobile or PC, with good quality internet connection. 2. Operational features : - Total Sessions = 150 - Session Duration = 120 sessions of The Hindu – 90 min approx., 15 sessions of the IE – 150 min approx., 15 sessions of Answer Writing – 120 min approx. 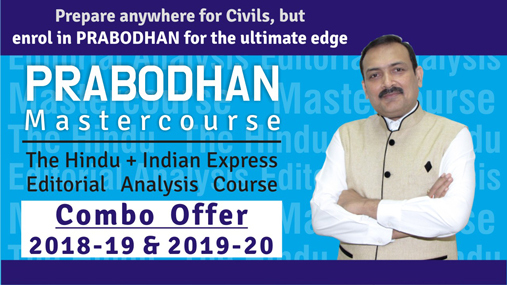 - Course commences : 10 June, Monday, 2019, Concluding Session : 30 March 2020 - Enrolment valid from joining date to 31-May-2020 - Off days / Holidays : Will be announced in advance - Can enrol anytime as per fees applicable (Original Fees : Rs.18,900/-, Welcome Fees Offer : Rs.11900/- only, till 10 June, 2019) - Each session can be viewed LIVE (first view), and upto two times in Archives - Archives section : You can pause the streaming session while making notes etc. so you don't miss anything (though in the first viewing, avoid pausing) - Total Viewing Time (excluding Live) : 500 hours - Medium of instruction : English only (5 to 10% Hindi may be used) - Sessions cannot be downloaded in Online Mastercourse; PDFs are downloadable 3. Supporting material : Quizzes, PDFs of Quizzes that you can download 4. Total course is of 150 sessions in all. 1. Complete Solution : You will stop worrying about reading the core of The Hindu and the Indian Express – the editorials. We do it for you, and present the gist beautifully. Please note that we will not cover any other part (regular news). Hundreds of painstaking hours saved, plus new insights gained. 2. Deepest insights : Reading an editorial, and actually getting to its core from an exam's perspective, can be time consuming. We save your precious time (hundreds of hours overall) so you can invest that on studying regular subjects of G.S. for the exam. Teaching pattern will be pointwise explanation in English (of main edit pieces, main articles, and articles from Op-Ed page). 3. Great Notes : Each session will help you write excellent notes on the Editorials (from what the faculty will explain on screen, pointwise). Over time, it will a golden collection of exams-oriented points and insights. Worth its weight in gold! This is the best answer-writing practice you will have, over hundreds of topics. 4. Get the best from Master Faculty Shri Sandeep Manudhane : He is an ace trainer and faculty since 25 years, creator of PT education, PT’s IAS Academy and Bodhi Booster knowledge portal, a regular contributor to newspapers, and a Quora Top Writer. Intense reader since 30 years +. 5. Our Promise : You will be thrilled to learn about complex and diverse issues in a new, interesting and amazing manner. The language used by Faculty will be easy to understand, and all real-world examples will be used amply in the Course. 6. Useful for : All Civil Services exams especially UPSC IAS, Professional needs, Self-learning and growth 7. Excellent Community : Some of the best brains will be part of the learning community. The Comments thread on each live session will be full of intense learning for everyone. 1. The Mastercourse is online, & you can attend it on a Mobile or PC, with good quality internet connection. 2. Operational features : - Total Sessions = 150 - Session Duration = 120 sessions of The Hindu – 90 min approx., 15 sessions of the IE – 150 min approx., 15 sessions of Answer Writing – 120 min approx. - Course commences : 10 June, Monday, 2019, Concluding Session : 30 March 2020 - Enrolment valid from joining date to 31-May-2020 - Off days / Holidays : Will be announced in advance - Can enrol anytime as per fees applicable - Each session can be viewed LIVE (first view), and upto two times in Archives - Archives section : You can pause the streaming session while making notes etc. so you don't miss anything (though in the first viewing, avoid pausing) - Total Viewing Time (excluding Live) : 540 + 500 hours - Medium of instruction : English only (5 to 10% Hindi may be used) - Sessions cannot be downloaded in Online Mastercourse; PDFs are downloadable 3. Supporting material : Quizzes, PDFs of Quizzes that you can download 4. Total course is of 180 + 150 sessions in all. 1. Complete Solution : You will stop worrying about reading the core of The Hindu and the Indian Express – the editorials. We do it for you, and present the gist beautifully. Please note that we will not cover any other part (regular news). Hundreds of painstaking hours saved, plus new insights gained. 2. Deepest insights : Reading an editorial, and actually getting to its core from an exam's perspective, can be time consuming. We save your precious time (hundreds of hours overall) so you can invest that on studying regular subjects of G.S. for the exam. Teaching pattern will be pointwise explanation in English (of main edit pieces, main articles, and articles from Op-Ed page). 3. Great Notes : Each session will help you write excellent notes on the Editorials (from what the faculty will explain on screen, pointwise). Over time, it will a golden collection of exams-oriented points and insights. Worth its weight in gold! This is the best answer-writing practice you will have, over hundreds of topics. 4. Get the best from Master Faculty Shri Sandeep Manudhane : He is an ace trainer and faculty since 25 years, creator of PT education, PT’s IAS Academy and Bodhi Booster knowledge portal, a regular contributor to newspapers, and a Quora Top Writer. Intense reader since 30 years + 5. Our Promise : You will be thrilled to learn about complex and diverse issues in a new, interesting and amazing manner. The language used by Faculty will be easy to understand, and all real-world examples will be used amply in the Course. 6. Useful for : All Civil Services exams especially UPSC IAS, Professional needs, Self-learning and growth 7. Excellent Community : Some of the best brains will be part of the learning community. The Comments thread on each live session will be full of intense learning for everyone.